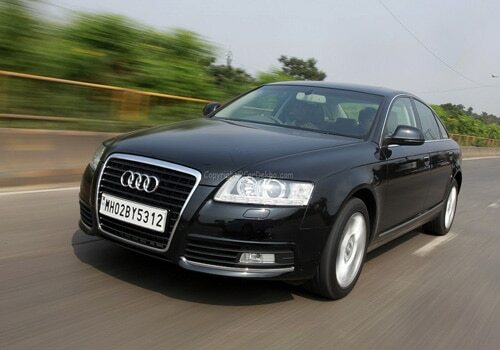 Cars from Audi have been liked a lot in India. In the 80s, it was cricketer Ravi Shastri who got an Audi 100 (which is also a predecessor of the A6) for making India win the Champions Of Champions Trophy in Australia. Audi cars are known for their elegance and grace. These cars have a mix of driving pleasure and comfort. The car in question today is the A6. The A6 for Audi is what the 5 Series is for BMW and the E Class is for Mercedes. The A6 is the 2nd best seller from Audi after the A4. We drive the Audi A6 2.7 TDI to bring you this review. Audis have a very sporty yet elegant character in their design and the A6 is also loaded with that grace. The front is mostly taken over by the typical single frame Audi grill which extends low and merges into the air dam. The popular 4 ring Audi monogram adds to the grace to the fronterior. A long bonnet with soft rounded crease on them gives the car that elegance, the slim fenders that merge on the low slung bumpers, the Xenon headlamps with LED strips in the head lamps are the best that we've seen in this segment. They look wonderful even in the day time when the Day Time Running Lights are on. The Audi A6 2.7 TDI has one of the most expressive fronts of a car in this segment. The sides on the A6 are no where less in elegance. A rounded waistline coupled with slim fenders and alloys add to its grace. The glass house is also good on the A6. The only grouse that we have is the lift type door handles that don’t gel with the overall feel of the Audi A6 2.7 TDI. The rear quarter glass is the best part of the side profile of the Audi A6 along with the wing mirrors with LED turn signals integrated in them. The rear of the A6 has a small lip on the boot lid along with a chrome strip running across on the bumper. The upward tapering LED tail lamps gel with the overall look of the Audi A6 2.7 TDI while the twin exhausts add to the sporty feel at the rear. A neat little sunroof and the mandatory radio antenna do their duty on the roofline. Overall the Audi A6 2.7 TDI scores a lot in the design department and looks big and sporty yet elegant. Step in to the A6 and a typical German designed cabin welcomes you. Well laid out dash with a basic looking but smartly done instrument cluster with the MID display between the Speedometer and the RPM meters. There are wood and chrome inserts on the dash as well as the door panels and yes the centre console is fully decked with wood. The material used on the dash is of high quality and has the soft foamy feel to it. Brushed aluminum inserts around the Speedometer bring in the sporty character into the cabin area. A three spoke steering with the typical Audi steering centre with all the control buttons for the audio and voice connectivity are neatly laid on it. The centre of the dash is taken by the 6.5 inches display screen that Audi calls as the MMI (multimedia interface) which is something like the i-drive that the BMWs have, you can control the various audio-video, telephone via Bluetooth, air conditioner setting and also keep a check on the various vital parameters of your car via the jog dial on the centre console. There also is a Navigation feature but that’s not active for India as of now. There is no Audio player on the dash but there are 2 inside the glove box. The sound system is from Bose and do we have to say more, the name says it all! You also can opt for the Luxury package that will get you an 8 channel amp with 13 Bose speakers, with 270 Watts of total harmony. The glove box opens by pressing a button which is placed next to the MMI screen. Inside it are 2 DVD changers that are connected to the Bose amp that’s mounted in the boot. The changer also has a card reader slot but we sorely missed an USB port and the AUX connection in here. You also have a provision of fitting 2 screens behind the back of the front seats and have a remote that’s neatly tucked in the foldable armrest of the rear seat. The centre dash reminds of an aircraft's cockpit with lots of buttons and dials spread out. The Auto gear changer is also nicely shaped more like an aircrafts toggle. The dials are in all aluminum and have a nice feel to them during usage. The front seats are wrapped in leather and are fully electrically adjustable except the head rests; these offer adequate lumber support and comfort is at its height. The centre arm rest gives support to your left arm during those long drives. The rear seats have the 40-60 lockable fold option to them. The seats offer good support and are best suited for 2 passengers. The foldable arm rest as mentioned earlier has a neat remote tucked in and a push-out can/glass holder which again has that nice feel to it. Electrically folding rear windshield curtain is standard and the curtain on the side windows are manually opera tive. The sun/moon roof opens in 6 positions. The cabin is silent and not much of the outside world can be heard in here. Let us add here the 546 lts of boot area that is more than enough to fit in most of your luggage. The Audi A6 2.7 TDI has a very classy interior made from the best of material and feature list is high. Plush interiors with very rich and comfortable looking and feeling seats, classy switches and knobs and the aircraft like centre console make the Audi A6 cabin one of the best of the lot. The A6 we drove came powered by a 2.7 Litre TDI engine that has 24 valves and is rated at 190hp and has 380 Nm of torque between 1400 – 3500 RPM on it. This six cylinder Diesel engine is highly refined and we found out a highly fuel efficient engine. The key hole to start the car is on the left to the driver which Is unique. Ok we missed the button start which is a common thing in this segment but we also liked this different engine starting style on the A6. Crank the engine and the refinement of this V6 diesel unit is the 1st thing that’s noticed. It revs smoothly. The engine note is very smooth and refined. Shift the changer to Drive and the A6 surges ahead in a linear manner. A sedate power is felt till the 1800rpm which is when the VGT turbocharger comes to life and the world starts to feel much quicker. Even though the 190Hp may feel a tad less on paper but in practicality on the roads, the Audi A6 2.7 TDI is a very fast car. The 7 speed auto gear box shifts gears seamlessly and neither the passengers nor the driver can feel the shift at any point of time or speed. As the speed builds up, the steering feels amazing to hold as the feedback is just right. To feel the in-gear thrust we drove in the tip-tronic mode and that is when you realize what a superbly engineered sub 200bhp V6 engine can really do. We touched a speed of 190kmph with great ease and with the top speed of 227kmph which we feel would be very easily achievable. The 0 to 60 kmph speed is touched in 6 seconds and the 0 to 100 kmph speed is achieved in just 8.3 seconds which is very quick. The handling of the Audi A6 2.7 TDI is a mix of sportiness and comfort. The suspension is also tuned accordingly. Audis are sweet handlers and the A6 did impress us. Handling sharp bends and corners was cake walk for it and it excelled in all tests and bad terrains we put it in. The ride quality is good and the power is available as and when you need it. The brakes are a all disc set up assisted by ABS, EPS and EBD and bring the 17 incher wheels to stop very sanely. Front and rear side airbags come standard with a host of other features which include rain sensing wipers, electro mechanical hand brake, auto head lamps, rear camera which comes into action while reversing and parking along with the parktronics. The suspension setup is tuned on the softer side and absorbs all the bumps and thuds very nicely. The gas filled shox coupled with anti roll bars offer a very smooth and comfortable ride quality. We told this at the beginning that this 2.7 litre TDI engine is one of the fuel-efficient V6 Diesels around in its segment. We achieved a fuel efficiency figures of 7.5kmpl in over all driving conditions that include a lot of city driving and some open hearted thrusts on the freeways. Priced at Rs. 37,7000 (ex showroom, Maharashtra) the Audi A6 2.7 TDI sure does sound a very tempting package coupled with the fact that it comes from a auto maker which is one of the best in the industry and with good efficient engine that has more than enough power needed. The bottom line is the Audi A6 2.7 TDI has all the virtues needed to make that complete Executive car and much more. A very good choice for someone who is shopping for a Luxury Sedan in the 35-40 lakh price range.